Imagine a great and fun-filled New Year’s Eve party in your home or a banquet hall, all showering with exquisite décor and hanging candles. The attendees wearing humorous expressions and taking snaps with their loved ones in the welcoming of New Year. A charming and interesting idea without a doubt! Well then how about to make it all happen? The thought may seem quite expensive and stressful, but in reality it can come true with little investment and efforts. 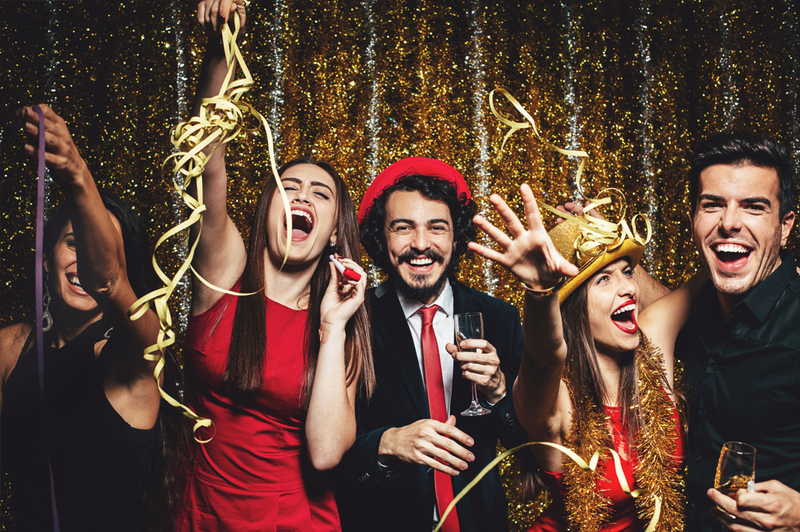 So let’s explore some food, games and decorations ideas you can use to become the best party planner for the upcoming year in a hugely active city like New Jersey. Inform the guests in the first place about the party being an all BYOA affair. A number of cheap appetizers and snacks can be bought. While if someone is short of cooking skills, they can still purchase some quick items from the store next-door such as raw veggies, a fruit and nut platter, a cheese and crackers pack, etc. If this also seems somewhat difficult, ask the invitee to bring a container or two of mixed nuts. It’s a relief when you won’t be needing to spend big bucks on champagne. Well you can catch a close relative of it by making a serving of champagne sangria. You can study a number of great online resources for recipes and different offerings of this delicious toast. After everyone is done with the midnight toasts, you can invite them for a midnight supper. The thought of a baked potato bar is easily cheap and fun. Bake the thickest potatoes you lay your hands on and follow them with a dessert. An average baked potato bar can get ready in an hour costing around $2 per person even with the added taste of sour cream, jalapenos, or cheddar cheese toppings. For dessert, you can go with a chocolate cake with colorful sprinkles. Since it’s the New Year’s Eve, and mostly everyone’s hoping the real fun starts after the midnight mark and stay for long enough, be sure to start the party at 10 pm. But if you have no plans to stay up late, get the potato bar ready till 10 or 11 pm, so the guests don’t leave without devouring anything. If the invitees are your closest friends looking to spend extended hours together, you can skip the appetizers option and go for a full-fledged potluck affair early enough. 5. Everyone bring along a ridiculous noisemaker! Conduct a “maddest noisemaker” contest and shoot a complete video. Judge the content on the basis of voting for who gave the craziest performance. A prize should surely be on the cards though—an earmuffs! Then gather everyone together to make the best racket as the big awaited countdown ticks closer. Ask a guest with nice photography skills to cover the big moment, or rather do it for yourself. Ask the guests to gather, do some old school stuff of taking pictures such as one person seated while another one standing next to him/her with smiles wiped off from their faces. How about some old fashioned hats and a scarf to go more natural? Have the guests write down their thoughtful predictions for the New Year. While during supper, read the predictions out aloud and ask the audience for guesses of the nameless papers. You may get surprised how difficult for everyone it will be to guess each other, not to mention a great and engaging activity to call it a night. Develop a festive theme by hanging paper snowflakes covered with silver or clear glitter by ribbons or threads from the ceiling. You can even opt for a pleasantly messy look by spreading them on tables or the floor. Curling ribbons is simple and a fun thing to use on different things. Play creatively by hanging the curls from doorways, lamps, lighting equipment, mirrors and other stuff you can think of. You can even disperse some curls on the dishes of midnight buffet. Take in as many candles as you can find. You can also ask the guests to bring the sticks they have. Light the candles in everything seeming appropriate including glasses, canning jars, etc. After all it’s the New Year’s Eve where nothing could get cuter and simpler than lighted candles.